Ahahah, so I pretty much failed on this challenge. 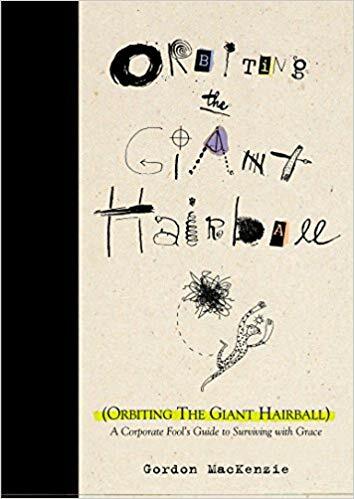 I got so far behind I didn’t even post two weeks ago that I finished Orbiting the Giant Hairball: A Corporate Fool’s Guide to Surviving with Grace. A few things about this book: first, it’s only sold as a bound book. These days it’s pretty rare for me to not buy a Kindle version but it came recommended from Mark Christian (again!) and so I ordered it without even reading a sample. Second, it took me about 100 pages before either the book hit its stride or I started to understand what the book was saying. Probably the latter. Usually if a book doesn’t click for me I put it down and never think about it again, but since this was for the challenge (and the book took up physical space on my side-table) I plowed ahead and I’m glad I did because I did enjoy the second half. Third, I’m not sure I liked this book, I definitely enjoyed reading it. Part of that is probably due to not really connecting with it for the first half. I might start it over some day when I’m feeling like reading it again. I’m mid-way through Douglas Adams’ The Long Dark Tea-Time of the Soul which I haven’t read in over a decade. Speaking of books where the journey might be more fun than the destination: I think the Dirk Gently series might be the ultimate example.